Safe Deposit Krabs (Episode) – From SpongePedia, the biggest SpongeBob-wiki in the world! Mr. Krabs hears about a new bank opening and the news broadcasting about it announces that the first 100 people to join get instant interest for a deposit. Mr. Krabs races to the bank and asks to see the money, which his earlier maniacal laughter made the security guards on duty think that he is a nut and he's dragged out of the bank. 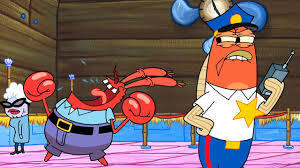 He attempts to get in a second time with a cheesy mustache disguise that doesn't fool the clerk, who calls security and Mr. Krabs is kicked out again. 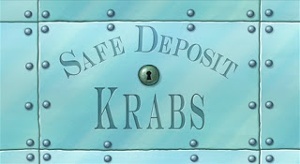 Mr. Krabs goes to the extreme as dressing up as a woman crab and asks for a safe deposit box and deposits one penny. He tries to kiss it inside the box and a guard that sees the door open slams it shut and locks it, pushing Mr. Krabs into the main vault where all of the money is stored. Meanwhile, back at the Krusty Krab, SpongeBob has just noticed that Mr. Krabs is still absent. He then goes on a search around Bikini Bottom to find him. Mr. Krabs realizes that he cannot leave the bank and decides that he's locked in all night and makes up people made of money. SpongeBob tells Pearl that Mr. Krabs is missing and Pearl tells him to call his cell phone number. Mr. Krabs has made a scenario of a restaurant and is dancing with a money-lady he named "Mrs. Greenback". Mr. Krabs answers his cell phone and tells SpongeBob that he's locked inside the bank and is having time of his life and that the low oxygen (and rapidly climbing cardon dioxide) levels inside the vault are starting to make him lose his mind. SpongeBob goes to Patrick to ask him to assist him in breaking into the bank. Meanwhile, Mr. Krabs hallucinates that he is on an unhabitable deserted island that has no food and goes off to search for some. SpongeBob and Patrick attempt to scale the bank wall to the roof using a chain of old shoelaces and a grappling hook, but the roof vent leads them to another building. Mr. Krabs then begins to hallucinate the island and world on fire and that a vacuum cleaner is a money-sucking monster that ate "Mrs. Greenback" and he begins to attack it. Patrick and SpongeBob try to pick the lock to the door of the bank with a screwdriver and then try a crowbar. But before they can attempt to pry the door open, the bank opens and they fall over and Patrick, thinking that they'd been detected, sprints away. The bank manager asks SpongeBob what that was about and attempts to call security. SpongeBob then asks if he could withdraw Mr. Krabs from the main vault and the manager goes to the vault to see if Mr. Krabs was in there. Mr. Krabs has finally defeated the "monster" and the manager angrily asks for security. SpongeBob and Mr. Krabs are kicked out the front door with Mr. Krabs' "deposit". Mr. Krabs demands interest they promised and he only gets a second penny, which makes him really happy. This is the first appearance of the bank of Bikini Bottom. This episode aired right before summer hiatus and the premiere of Sanjay and Craig. This page was last modified on 9 March 2019, at 09:51.